What started as a school requirement turned Amy into a passionate reader. Growing up, books were not readily available to a child like her. Coming from a poor family, her parents didn’t have the means to buy their child a book. When she entered Hungry Minds School, she realized how her teachers encourage students to read books regularly and prepare book reports. Like other Hungry Minds students, Amy developed the habit of reading. But, the school doesn’t have its own library. Kuya Oliver, an art teacher/volunteer, recognized this and wanted to do something about it. He started to work on a simple “project.” And with the help of his friends, Kuya Oliver was able to collect books for the Hungry Minds students. 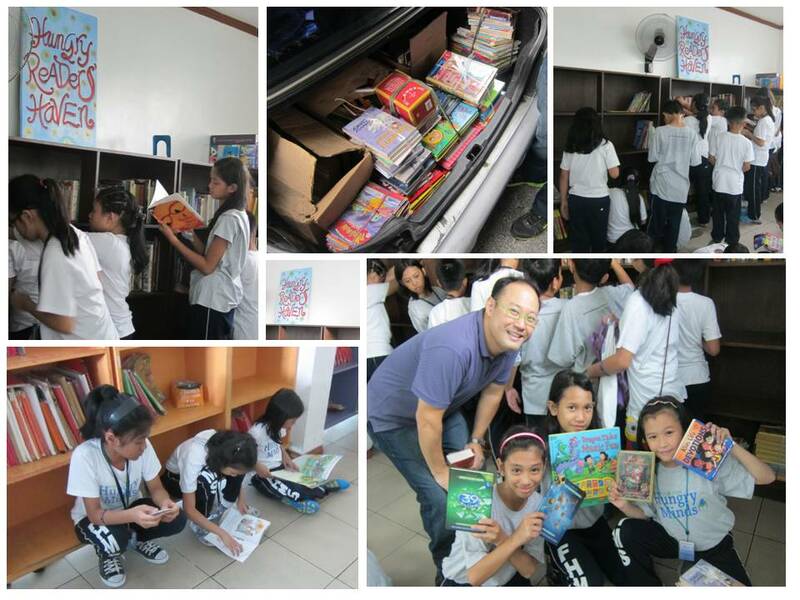 Last week, he brought all the books and asked the students to help organize and arrange them properly onto the bookshelves that he also donated. Now, Amy and other Hungry Minds students can read more books that will not only help them in their book reports – but will also continue to develop a love for reading. Reading opens up untold vistas of learning and exposure to life, people and places that many people, not just these kids, for one reason or another, don’t and won’t even get to see or experience except in the pages of these treasures called books.